Background Methamphetamine use and stroke are significant public health problems. Strokes among people aged below 45 years are much less common than in older age groups but have significant mortality and morbidity. Methamphetamine is a putative cause of strokes among younger people. Methods A review of methamphetamine-related strokes was conducted. 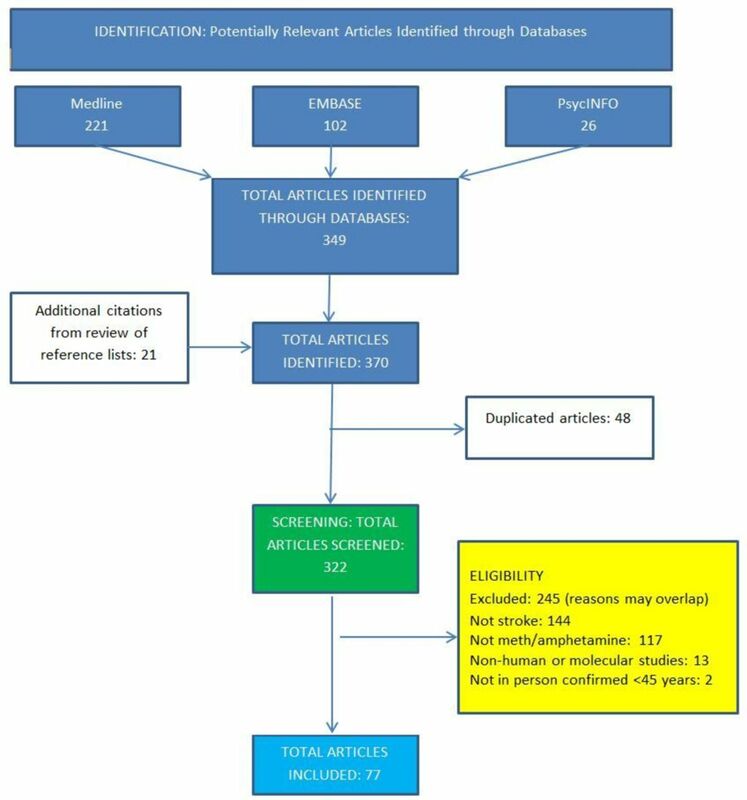 Bibliographic databases were searched until February 2017 for articles related to methamphetamine and stroke. Both haemorrhagic and ischaemic strokes were considered. Results Of 370 articles screened, 77 were selected for inclusion. There were 81 haemorrhagic and 17 ischaemic strokes reported in case reports and series. Both types were approximately twice as common in males. Route of administration associated with haemorrhagic stroke was typically oral or injecting, but for ischaemic stroke inhalation was most common. Haemorrhagic stroke was associated with vascular abnormalities in a third of cases. One quarter of individuals completely recovered, and a third died following haemorrhagic stroke. One-fifth completely recovered, and one-fifth died following ischaemic stroke. Conclusions There is a preponderance of haemorrhagic strokes associated with methamphetamine use in young people, and methamphetamine-related stroke is associated with poor clinical outcomes. Mechanisms of methamphetamine-associated stroke include hypertension, vasculitis, direct vascular toxicity and vasospasm. In a period of rising worldwide methamphetamine use, the incidence of methamphetamine-related stroke will increase, with a consequent increase in the burden of disease contributed by such events. determine the evidence for the pathogenesis of methamphetamine-related stroke. The EMBASE (Embase Classic+Embase), MedLine (Ovid MEDLINE Epub Ahead of Print, In-Process & Other Non-Indexed Citations, Ovid MEDLINE Daily, Ovid MEDLINE and Versions) and PsycINFO (PsycINFO) bibliographic databases were searched until 10 February 2017 for articles on the association between meth/amphetamine use and strokes in young people (figure 1). Search terms included: methamphetamine, amphetamine and common variants, stroke, cerebrovascular disorders and cerebral haemorrhage. Hand-searching of reference lists of included studies was also conducted. The search was restricted to English-language publications or to those with a comprehensive abstract in English that was sufficiently detailed. There was no restriction on year of publication. The search strategy is provided in detail in the online supplementary figure s1. Methodology of the review and flow diagram. Studies were eligible for inclusion if they were published in a peer-reviewed journal or referenced in a relevant journal article. Studies that focused on the relationship between methamphetamine use and incident stroke were included. Where putative additional or alternative risk factors for stroke were reported, these were detailed (table 1). Consistent with literature on strokes in young people,13 17 studies were included if they reported cases of methamphetamine/amphetamine-associated stroke in people aged 44 years or below. Both ischaemic and haemorrhagic strokes were considered. Studies were included only where the drug was used for abuse purposes, excluding studies reporting effects of prescribed amphetamines and related compounds. Where polydrug use was recorded, this was documented where relevant. Dextroamphetamine was included only where it was used for abuse purposes. A total of 77 papers met search criteria (figure 1). These comprised three postmortem studies, 11 case control and epidemiological studies and 63 case series/case reports. Several large postmortem series report that between 1% and 5% of all-age methamphetamine-related deaths are caused by intracranial haemorrhage, with cases of both subarachnoid and ICH reported27–29 (table 2). Case series conducted over the past four decades identify amphetamines as a cause of stroke in 6%–13% of haemorrhagic15 20 30–32 and 2%–6% of ischaemic stroke16 21 (table 3). These differences reflect rates of use in the area the study was undertaken, and change in use patterns over time. It is noteworthy that higher rates of stroke associated with methamphetamine were recorded in the past decade, with three studies of haemorrhagic stroke32–34 reporting rates of methamphetamine use between 7% and 13%, despite these series being in all-age populations. Because methamphetamine use is predominantly associated with younger age, the proportion of methamphetamine-associated strokes in these series among those <45 years (though unreported) is likely to be even higher. Similarly, Phillips and coworkers’16 case series of ischaemic stroke among individuals aged 15–50 years reports a higher rate due to amphetamine (6%) than the 2% identified in a study conducted a decade earlier.21 In addition, it is likely that drug use as a contributory cause may often be underestimated, as suitable investigations or testing for drug use may not be conducted or recorded. Several epidemiological studies have demonstrated a significantly increased risk of stroke among young meth/amphetamine users.24 25 Westover and coworkers25 conducted separate analyses for haemorrhagic and ischaemic stroke. Amphetamine use was significantly associated with a 4.95 increased risk of haemorrhagic stroke, a risk more than twice that conferred by either cocaine or tobacco use. The authors also noted a dramatic increase in the rate of amphetamine-associated stroke over the 3-year timeframe of their study, which was greater than the rate of increase in strokes associated with any other illicit drug. Consistent with these findings, Huang and coworkers26 compared stroke events in a large cohort of methamphetamine users of all ages and found significantly increased risk of haemorrhagic stroke among methamphetamine users, but not of ischaemic stroke. Table 1 summarises a total of 63 case studies and series of 98 strokes associated with methamphetamine use in young people aged <45 years. Of the 81 reported strokes that were haemorrhagic, the male to female ratio was 2:1. There was variation in the route of administration, with an oral to injection to inhalation ratio of 3:3:1. Methamphetamine-related stroke was thus not solely associated with a particular route of administration. Headache was a prominent early clinical feature, with vomiting, one-sided weakness and seizures often developing over time. ICHs were present in 60 cases, predominantly in the temporal, parietal and occipital cortices. Less common sites were the cerebellum (two) and brainstem (three). There were 32 cases of subarachnoid haemorrhage (SAH), among whom 13 had both ICH and SAH. Intraventricular haemorrhage was present in five cases, but only in one case in the absence of ICH. Aneurysms and AVMs were present in 17% and 8%, respectively. Other vasculature abnormalities were reported in a third of cases, most commonly beading of vessel wall or cerebral arteritis with or without occlusive changes in the small arteries. Irregularities of the vessel lumen were present in a minority of cases. No abnormality of vasculature was found in less than half of cases (47%). Haemorrhagic stroke resulted in death in a third of cases. Complete recovery was reported in one quarter and the remainder (approximately 40%) had residual symptoms ranging from mild weakness and memory difficulties, to permanent hemiparesis, speech and language difficulties and visual defects. Of the 17 ischaemic strokes, the male to female ratio was 12:5. The route of administration differed notably from haemorrhagic stroke with a higher preponderance of inhalational use (the oral:injection:inhalation ratio was 1:1:4). Again, these strokes occurred across all routes of administration. Headache was again the predominant early presenting feature, with hypertension frequently reported. Ischaemic strokes were predominantly located in regions whose blood supply derives from the anterior circulation: the frontal and parietal lobes and/or the basal ganglia. A minority were located in the occipital lobe or caudal thalamus indicating a posterior circulation infarction. One case extended from frontal to occipital lobes, suggestive of involvement of both anterior and posterior circulations. Of note, Philips and coworkers16 found that methamphetamine use was significantly more common among individuals aged 15–50 years with stroke involving both vascular territories compared with their whole study population. Angiography was less commonly conducted in ischaemic stroke cases. Where performed, beading suggestive of arteritis was present in three cases and intimal wall thickening in one. No abnormality was detected in four cases, which was interpreted by some authors as suggestive that vasospasm may have been the cause, due to absence of any permanent vessel occlusion.33 Other causes of infarction included bacterial embolus (one case) and thrombus from carotid artery dissection (two cases). The outcome was death in approximately 20% of cases. Complete recovery was achieved in a further 20%. The majority of cases (approximately 60%), however, experienced residual impairments such as hemiparesis, speech and visual deficits. In keeping with previous reports,34 this review highlights that strokes can occur following any route of methamphetamine administration. Haemorrhagic strokes occurred following oral or intravenous use in similar numbers. Stroke may result following injection of any drug due to increased risk of bacterial endocarditis and embolism, or due to the use of fillers such as talc, which may contribute to both ischaemic and haemorrhagic stroke.36 Injecting alone, however, does not explain all strokes. In these cases, it is use of methamphetamine that confers the risk. The proportions of strokes due to oral, injecting or inhalational routes may reflect general use prevalence of the drug, but it is noteworthy that starkly different use patterns exist between ischaemic and haemorrhagic strokes, with a relatively higher proportion of ischaemic strokes associated with inhalation. Methamphetamine-associated stroke was less common in women than men, which may reflect the 3:1 ratio of use patterns in the general population, and/or other risk factors for stroke in this age population.15 17 Many studies did not report additional risk factors for stroke in the affected individuals, suggesting that in this young population haemorrhagic strokes in particular were related primarily to methamphetamine use. However, the presence of other undetected or unreported risk factors cannot be excluded. In the ischaemic stroke literature, other risk factors for stroke were detailed in some cases (table 1). It is notable that several young people were reported to have resting hypertension, which may or may not been a consequence of chronic methamphetamine use. Chronic use can cause long-term systemic hypertension,5 7 a major risk factor for stroke. Both methamphetamine and cocaine contribute to physiological vascular fatigue by their pharmacological actions of hypertension and tachycardia.41 The more prolonged cardiovascular effect of methamphetamine compared with cocaine41 is a possible explanation for increased rates of ICH in methamphetamine abuse compared with cocaine.25 Vascular fatigue in a berry aneurysm leads to rupture and, often, to death. Furthermore, because vascular fatigue is cumulative, chronic previous methamphetamine use may be a significant factor in the development of berry aneurysms.41 McEvoy and coworkers42 suggest that cerebral aneurysms may form acutely in response to hypertensive crisis and or vasculitis induced by methamphetamine use. In a large case series of 30 all-age methamphetamine related stroke, however, Ho and coworkers35 found no evidence of an inflammatory vasculitic process underlying ischaemic stroke. Rather, they concluded that methamphetamine-associated vessel damage may occur as a result of accelerated atherosclerosis. Methamphetamine increases both systolic and diastolic blood pressures. Repeated exposure to transient use-related hypertension or the development of chronic hypertension in habitual methamphetamine users exposes individuals to heightened risk of arteriosclerosis pathogenesis, and associated arterial weakness, many years prematurely compared with the general population. Methamphetamine may also increase the risk of stroke through the highly increased risk of cardiomyopathy, and with that an increased risk of arrhythmias and thrombosis, leading to thromboembolic strokes. Clinicians treating methamphetamine users, and users themselves, need to be aware of the elevated risk of stroke in young methamphetamine users and to be aware of early signs and symptoms. Of note, symptoms such as paraesthesiae, headache, speech and language difficulties and visual defects, may be experienced transiently as a result of vasospasm, for example, and may herald later experience of a catastrophic stroke event. Conversely, young people presenting with signs and symptoms of stoke may well be methamphetamine users, highlighting the need for illicit drug use to be investigated as a contributory cause. A thorough substance use history should be sought and toxicological screening of urine and serum performed in young people presenting with stroke. This review focused on illicit amphetamine use and the data relating to stroke associated with prescribed amphetamines is beyond its scope. The possibility of increased stroke risk related to prescribed amphetamines for conditions such as attention deficit disorder is important and has been reviewed elsewhere.68 Similarly, the therapeutic use of amphetamines in stroke recovery has been systematically reviewed and found to be associated with increased death compared with control groups.69 Due consideration should be given to these risks when contemplating treatment options in young people. There is a preponderance of haemorrhagic strokes associated with methamphetamine use in young people, and methamphetamine-related stroke is associated with poorer clinical outcomes. Mechanisms of methamphetamine-associated stroke include hypertension, vasculitis, direct vascular toxicity and vasospasm. In a period of rising worldwide methamphetamine use, the incidence of methamphetamine-related stroke will increase, with a consequent increase in the burden of disease contributed by such events. We wish to thank Mary Kumvaj for her assistance and insights in conducting the literature review. United Nations Office on Drugs and Crime. World Drug Report 2016. New York: United Nations. 2016.
. Karch’s Pathology of Drug Abuse. 4th edition. Boca Raton: CRC Press, 2009. European Monitoring Centre for Drugs and Drug Addiction. Exploring methamphetamine trends in Europe EMCDDA Papers. Luxembourg: Publications Office of the European Union, 2014. Center for Behavioral Health Statistics and Quality. Behavioral health trends in the United States: results from the 2014 National Survey on Drug Use and Health. Rockville: US Department of Health and Human Services, 2015.
. Drug Misuse: findings from the 2015/16 crime survey for England and Wales. Second edition. London: Home Office, 2016.
. Cerebral vasculitis in a drug abuser. J Clin Psychiatry 1978;39:559–64.
. [Intracerebral hemorrhage and characteristic angiographic changes associated with methamphetamine--a case report]. No To Shinkei 1986;38:967–71.
. Spontaneous intracerebral hemorrhage related to methamphetamine abuse: autopsy findings and clinical correlation. Am J Forensic Med Pathol 2004;25:334–7.
. Intranasal caffeine and amphetamine causing stroke. Acta Neurol Belg 1993;93:146–9.
. Methamphetamine-associated reversible cardiomyopathy and stroke risk. Eur Rev Med Pharmacol Sci 2014;18:2403–4. Contributors Dr JML performed the literature searches and conducted the statistical analyses and write-up of the paper. Professors SD and MF contributed to writing the manuscript and to subsequent revisions. All authors have approved the final manuscript.